Cottage in Lahos, Nr. Frikes, Ithaca Island, Greece - Peaceful Location yet Close to the Coast. This simple, whitewashed cottage was built over a hundred years ago. It has been renovated and updated to make a comfortable family home but still retains its old world character with its arched windows, ancient shutters and original wooden ceilings. It is light and airy, with at least 2 windows in each bedroom. Two french doors open onto the sun terrace from the open plan living room and kitchen. The kitchen is has a full cooker and large fridge/freezer. There is also a large shower room containing a washing machine. It is tiled in terracotta throughout. I'm a retired film maker who has always loved Greece. I found and restored this cottage 19 years ago. I fell in love with this cottage because of its location and character. Looking out over the countryside from the terrace. Bathroom with wc, shower wash basin and washing machine. Open plan living room with 2 sofas and two french doors onto the terrace. CD player and radio. Full oven, large fridge freezer, kettle, toaster, coffee maker. Typically Greek island accommodation. An authentic feel. We had a perfect holiday in Ithaca. Your lovely cottage was the ideal base to explore the stunning and dramatic sites - beaches, towns, villages - that Ithaca has to offer. We also had delightful visitors in the form of nearby goats with their bells warning us of their advance. We hope to be back. Fourty years ago we visited Ithaca for the first time. The athmosfere of those days is still hanging on that green island. The Riannon cottage fitted perfectly in the surch of the Old days....however renovated, so with the needs of the modern times. The view from the terras makes it hard to be active. And on a rainy day you can relax also in the cosy inside.... A beautiful mountainvillage and a small port with tavernes are close by. We understand the homesickness of Ullyseus! Lovely unspoilt cottage on lovely unspoilt island. The house is slightly old-fashioned and feels very "Greek", which we loved. The beds were comfortable, the hot water very reliable and the shower good. Kitchen facilities were fine and it was nice to arrive to a bowl of fruit and some tea and coffee. do need a hire car. and Kioni), quiet, fascinating rock formations & a wall to sit on to get changed! ), glorious mountain views. Restaurants : tried all 3 at Frikes, all good, all on the water's edge. Also, Donna Lefkas at Lefkas (posh food), and Ithiki Restaurant in Stavros: Prawns with saganaki and fennel- delicious. What to see: Kathara Monastery, Anogi (stuffed aubergines terrific, wall-paintings in church & wonderful walk up to Old Anogi), School of Homer ( Odysseus' Palace?) Esther does guided walks, very good, and she shortened ours as we are all knocking on a bit!. Vahi, very picturesque, busy, good for souvenirs. Excellent fish soup in the alley leading to the folk museum (shut that day, for technical reasons!). It's just a pity Ithaka is difficult to get to in September, but we did drink from the spring at Kalamos, so our return is assured! We loved it. Delighted you enjoyed your stay. Charming rural cottage, sympathetically restored to retain authenticity, close to Frikes & beaches. Rhiannon cottage provided a perfect location for our stay on Ithaca. It is close to the Stavros village, the pretty little port Frikes and the wonderful beaches in Afales Bay. The cottage is simple and charming and well equipped. Michael and Britta (the housekeeper) were extremely helpful and even sourced an additional fan as the temps reached 35-40 degrees! The cottage is small but nicely done - we felt quickly comfortable and at home. Michael and Britta were very helpful answering questions and sorting things and the place was very clean and with everything we needed. We loved Ithaca, nearby Stavros, Frikes, and all the little coves and beaches - often empty and not overcrowded even in August. We'd love to come back to the island and the cottage! Note that to get to one bedroom you need to go through either one of the others (see floorplan) wasn't a problem for our family - we spent most our time there on the terrace! - but might not suit everyone. The perfect setting for our stay in Ithaca. Michael was extremely helpful in the build up to our holiday even going as far as to keep us updated with ferry timetables. The cottage itself was great with all the facilities needed for a comfortable stay. Being able to sit out on the terrace overlooking the spectacular landscape allowed us to escape and unwind. If you are looking for a peaceful retreat that is within driving distance of fabulous beaches, walks and restaurants than we would highly recommend a stay. 17 minute walk to the sea (2 minutes driving). 25 minute walk to nearest beach (4 minutes driving). The nearest airport is Argostoli in Kefalonia. Cars can be hired from the airport but are best booked in advance. If you are not hiring a car, a taxi from the airport to the port of Sami takes roughly forty minutes and costs about E40. The ferry takes half an hour to the Ithacan port of Piso Aetos and costs about about E3. A further taxi from the port to Lahos takes half an hour and costs about E30. 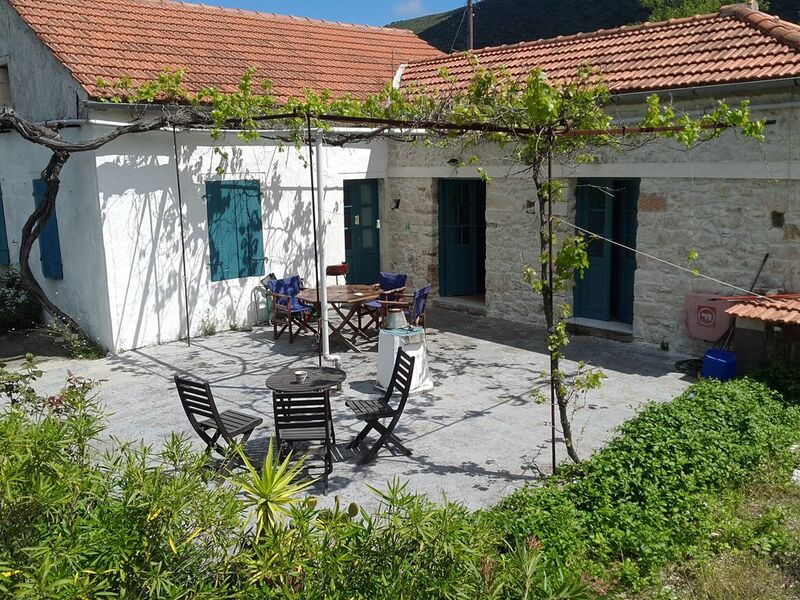 The cottage is set in half an acre of olive and almond trees on a winding country lane 5 minutes drive from the village of Stavros and 2 minutes from the tiny fishing port of Frikes. The nearest beach is 4 minutes drive. Kioni, a "picture postcard" village used by the upmarket holiday companies, is a five minute drive from Frikes. Booking Notes: 25% deposit required on booking. Balance 6 weeks before rental. Changeover Day: Changeover day is normally Sunday but flexibility is possible depending on bookings.